Update 8/31/2017: We no longer support the ability to import PowerPoint presentations as editable files, only as static images. In this article, I'm going to show you how you can easily migrate your PowerPoint slides online. The advantages of doing so include having complete control over editing, protecting your file, securing it with permissions and tracking activity. Trust me, you're gonna love this. 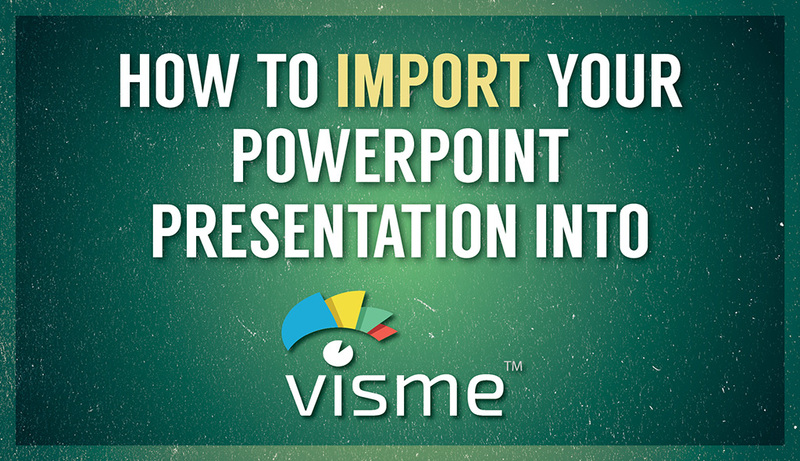 Also, if you're more of a visual learner, here's the video version of this short tutorial on how to import your PowerPoint slide decks into Visme. For over 20 years, PowerPoint has been the go-to software for creating presentations. Many don't even refer to their presentation as a presentation; they call it a PowerPoint. However, despite being used by millions of individuals and organizations around the world, the capabilities and user experience offered by PowerPoint has changed very little over the years. Chances are you are a PowerPoint user and, from what I've personally heard from the thousands of people and companies I've talked to, most use it because that's what they're used to or what their organization has told them to use. Ask yourself: Do you really believe PowerPoint is the best tool to create presentations? Or do you use it because it's within your comfort zone and you don't want to learn to use yet another program? Personally, I have nothing against PowerPoint. I was a user myself, but at some point, like any other entrepreneur, I woke up one day and decided if no one else was getting presentation tools right, then I was going to do it. So, over the last three years, my team and I have dedicated thousands of hours to create Visme to not only empower users to create better slide decks, but go beyond static presentations. Visme is an easy-to-use online presentation tool that allows anyone to create presentations from scratch or import PowerPoint files into Visme. The learning curve is extremely low, and if you are a PowerPoint user, you will feel right at home. You don't have access to statistics or analytics to know who actually viewed your slides. To share your project and collaborate with others, you must first upload your slide deck to a file-sharing service like OneDrive. You are not provided with a built-in library of high-quality vector icons, fonts and images. You cannot create anything besides presentations. Your slide deck will be accessible from anywhere, right in your browser. There is no further need to have email and download PPT files. You can access thousands of graphic assets to improve your presentation. 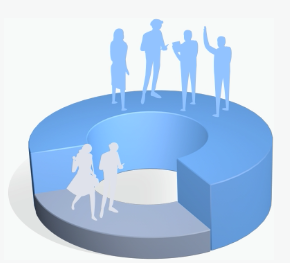 You will have the ability to add interactivity and animation to your slides. You can share your projects with your team and collaborate. You can organize your projects into folders. You can apply privacy control to your projects. You will have access to analytics. Track views, including location, IP address and the duration of each visit. Navigate to your Visme dahsboard, where you have all your Visme projects. Click the Import button at the top of the screen, next to the Create New Visme button. If you want to edit your presentation, choose the option "Import as editable." Edit and organize your PowerPoint slides. Publish, share, embed into a website or download for offline use. Most online presentation tools are very limited in terms of their import process. They may create a screen capture of your PowerPoint (flattening all layers of your slides into an image) or if they do import as several layers, they can't import many of the elements or handle a large number of slides and layers. At Visme, we spent months refining our import process and have thousands of presentations imported by users, including large organizations that have fully migrated all their PowerPoint presentations to Visme after deciding to abandon the legacy software. Additionally, Visme gives you advanced privacy controls, insights and analytics. It's the only tool that gives you all of these features under one umbrella. Best of all, we are continually refining Visme by adding new features and improvements. So, if you or your organization ever needs something, chances are all you need to do is ask for it. The reality is there will be instances in which some elements may not transfer from your PowerPoint or you may need to make some slight adjustments to a layer. 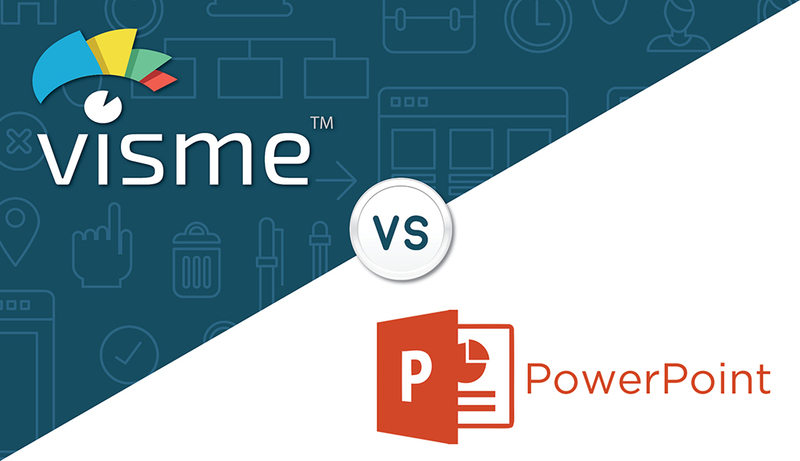 This can be a good thing, however, since it will allow you get to take advantage of Visme's editing features and its 100+ fonts, most of which are not available in PowerPoint. One of the advantages of Visme lies in the ability to have complete control of your projects' privacy and sharing capabilities. For example, you may have a project you want to share with another team member. You can do that with Visme or you can password protect your presentation so only those with credentials can access it. You can learn more about privacy and sharing here. Another big plus is the ability to visualize the traffic flow to your presentations. You can track everything from the number of visitors, the country and IP address they accessed the project from, as well as the duration of engagement with your presentation. You can learn more about tracking traffic to your presentations here. Visme also allows you to organize your projects into folders and search them by keyword, which is a great convenience as you add more projects. You can also organize your projects into folders and set permissions for each one. You can learn more about organizing presentations here. Additionally you can enable lead generation for your presentations and collect valuable insights (ex. Name, Email and Company). The data will be nicely collected into a repository which you can use to download and import into your favorite CRM or Newsletter system, such as SalesForce, MailChimp, Constant Contact or any other. You can learn more about generating leads here. 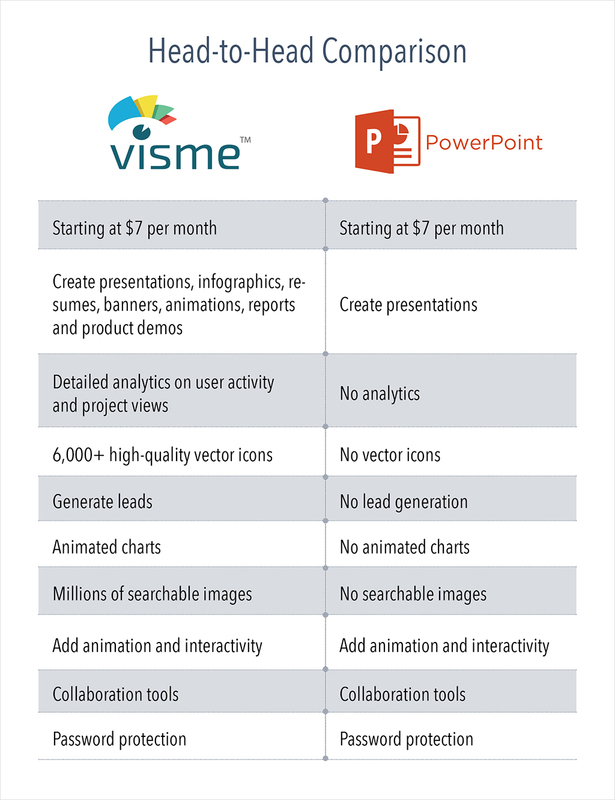 I think we've covered many of the advantages of migrating your PowerPoint presentations online and how Visme is the ideal tool for completing this process smoothly and with the least amount of editing work. If you'd like to see for yourself what Visme can do, take it for a test drive.